In this awareness-level online safety course, you will learn about Confined Spaces in Construction. 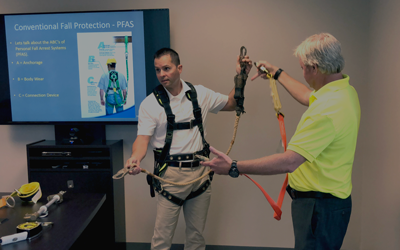 Find out how to utilize your existing knowledge on confined spaces while learning about new kinds of safety procedures and changing regulations. Confined spaces include manholes, crawl spaces and tanks that are not designed for continuous occupancy and are difficult to exit in the event of an emergency. Construction workers often perform tasks in confined spaces and these spaces can present physical and atmospheric hazards that can be prevented if addressed prior to entering the space to perform work. This course is principally intended for construction workers with only limited exposure in work locations where confined spaces exist, but which they are not permitted to enter, attend or otherwise work in those confined spaces. By completing this course, you will have a more thorough and up-to-date understanding of the equipment, systems and procedures necessary to assist you in reducing the risks of workplace accidents due to confined spaces. The student will be presented with interactive media to help them determine the recognition and potential threat of confined spaces.